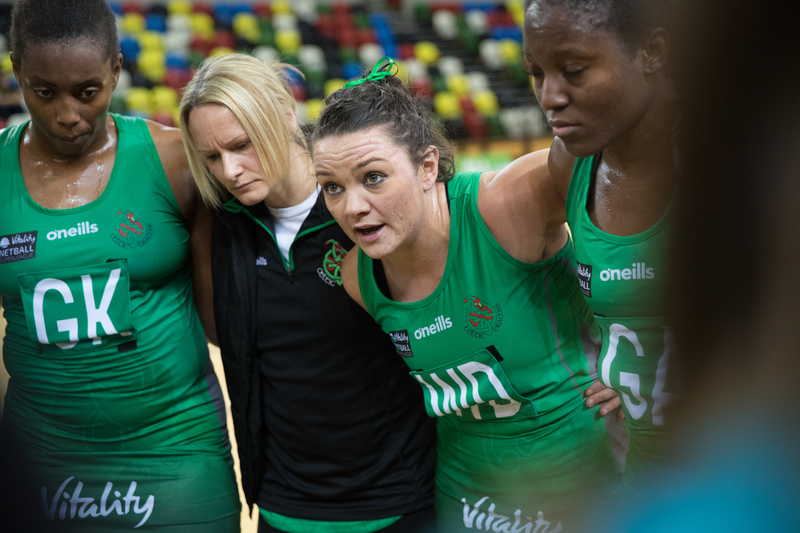 Dragons' captain Nia Jones speaks to team-mates during a huddle. Celtic Dragons are preparing for an Easter weekend double when they have two Vitality Netball Superleague matches on successive days. The Superleague teams are split between two venues with Dragons playing in Coventry – against Saracens Mavericks on Saturday and Wasps the following afternoon. Britain’s leading netball teams and players take to the court for Superleague’s ‘Big Easter Weekend’ to continue their battles. Dragons, Surrey Storm and Mavericks are at the Ricoh Arena, home of Wasps netball, while Strathclyde Sirens host newcomers London Pulse, last year’s finalists Loughborough Lightning and the formidable Manchester Thunder at the Emirates Arena in Glasgow. Celtic Dragons won 59-49 against Strathclyde Sirens in their last match, a fifth fixture of the season which the season double over the Scottish team in front of a sell out crowd at Cardiff Metropolitan University. In a feisty affair, the home team took a 29-23 half-time lead. Sirens attempted to stage a comeback, but the Dragons defence made some vital interceptions and went on to win. “The girls ground that win out in what was a physical game,” said head coach Tania Hoffman. Celtic Dragons took to a brand new Welsh Netball court at Cardiff Met’s National Indoor Athletics Centre to face their fierce Scottish rivals. Bethan Dyke was in shining form for Celtic Dragons against Strathclyde Sirens. Captain Nia Jones was able to effectively organise the defence of Sirens’ centre pass. The home team made an assertive start to the second period with Bethan Dyke darting around the court to find plenty of options for the Dragons drive. Dyke’s feeds into Kalifa McCollin kept Sirens at full stretch. Dee Bolakoro was also able to make a couple of trademark interceptions and Kyra Jones performed particularly well in defence. Chelsea Lewis remained strong under the goal , while Dyke continued to lead the Dragons attack and McCollin was also able to shoot some fancy long-rangers. Suzy Drane went on for Dyke at the start of the fourth quarter, her first start since an injury in the warm-up against Stars a fortnight ago. Dragons played with patience. Kyra Jones showed good control and decision-making at the circle edge. Another tip from Stacian Facey saw the visitors’ last real chance to stage a late comeback go astray and Clare Elsley went on for Nia Jones near the end. Elsley made an immediate impact as she set up a great feed into McCollin and Dragons closed out the game. Dragons results/fixtures 2019 – most home games played at the Sport Wales National Centre in Cardiff.